Oh look, cold and flu season has begun! It’s the time of year that every mother and teacher dreads. Just as the kids are back in school and daycare (and exposed to all the other kids there), bacteria and viruses explode. Here, strep is already making the rounds, along with a virus that sure looks like strep, but isn’t. The remedies, both OTC and otherwise, are coming out of the cupboard: vitamin C, elderberry gummies and tinctures, zinc cough drops, all the oils . . . you name it, someone has it. But one of the best ways to keep the immune system in tip-top shape is the hardest to obtain this time of year. It’s the elusive good-night’s-sleep. It’s common knowledge that sleep is good for us. Plenty of people experience the phenomenon of feeling something “coming on” that disappears after 10 hours of shut-eye. Small children are exceptional at sleeping off colds (their parents are less good at this). 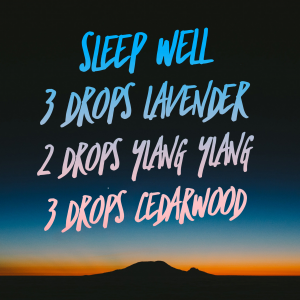 Every one of us moms knows how it feels to care around the clock for sick spouse and kids until, exhausted and sleep-deprived, we come down with a double dose of the crud. Maybe it’s the multiple exposures. Maybe it’s the sleep debt. Sleep debt comes in two forms. Short-term sleep debt happens when we usually get enough sleep but go short for a few days. 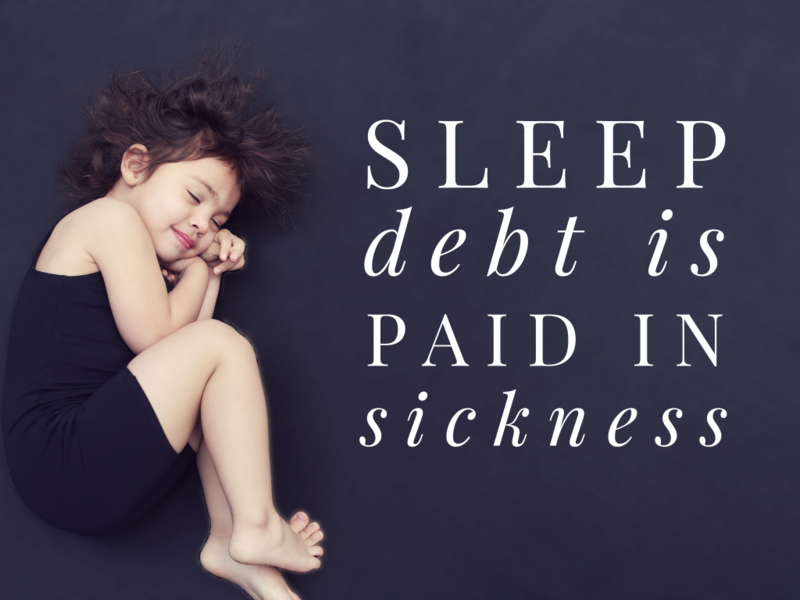 Chronic sleep debt occurs when we lack enough sleep night after night over the long term. Neither one is good for us. In addition to foggy thinking, low performance on testing, and difficulty focusing, sleep deprivation, especially chronic sleep debt, increases our risk for numerous chronic diseases. Chronic sleep debt can contribute to diabetes and heart disease risks, among others. It also affects our mental health. However, even short-term sleep debt can increase our risks of catching the next virus making its way through our community. Losing sleep doesn’t just make up tired and cranky, it actually prevents our immune system from working properly. Even when we sleep, our immune system doesn’t (thankfully). Sleep time is the peak time for the immune system to produce cytokines. Although cytokines have many roles in the body, not all of which are completely understood, we know they help protect the body from infection and disease. Without cytokines, our immune system doesn’t function correctly. When we don’t get enough sleep, even for a night, our protective cytokine production goes down. Going short on sleep also increases inflammatory markers in the body–and inflammation is the driver for numerous chronic illnesses while leaving us vulnerable to colds and flu. All of us mommas of littles can sit down and laugh at the irony. Or cry. The same goes for shift workers. Getting more sleep and getting better sleep is not as simple as it sounds. Even those who carefully guard their bedtimes can experience sleep interruptions from family, neighborhood noises, or nighttime wakefulness with no apparent reason. Often, even when we try to choose better sleep, it eludes us. Avoid caffeine late in the day. Most advice says to avoid any caffeine for 4-6 hours before bed (and that includes dark chocolate.) Many people have built up quite a resistance to caffeine, but even if you think it doesn’t affect you, it’s a good idea to start stepping it back before bedtime. Create a quiet, dark sleep environment. Use minimal or no night lights and keep clock lights low or turned to the wall. Some suggest curtailing electronic screens for an hour or two before bed to ensure the most relaxing sleep. If you live in a noisy part of town or building, a white noise machine or soft music may help muffle outside noises. For many years, I slept with earplugs in, because my neighbor on the other side of the wall would fight with her husband then vacuum at 1 am. Keep dinnertime earlier and don’t snack afterwards. A full stomach can make sleeping more difficult. Bonus, not snacking after dinner can be good for the waistline, too. Think about how you wake up, too. Letting natural light in first thing in the morning helps set your circadian rhythm. So does keeping a set time for waking, even on weekends. Although we are often admonished not to let clocks rule our lives, keeping the same bedtime and rising time from day to day is healthy, so long as we get enough sleep in between. But what if you’ve done all these, and they haven’t helped? Worse, what if you’re in a life situation where some of the typical advice isn’t doable? People who work rotating shifts can’t keep the habit of sleeping and waking at the same time from day to day. Parents of babies and toddlers will need to nighttime parent (and so will the parents of teens). Sometimes we are woken by outside noises no matter what we try, or our partner snores and keeps us up. It may be necessary to rise before the sun in the winter, and not everyone has the luxury of planning an early dinner. Some people turn to OTC sleep aids, which can help with occasional sleeplessness. While many are advertised as non-habit forming, meaning they shouldn’t affect your ability to sleep without them, humans are creatures of habit. We often find ourselves relying on things because we think we need them, more than because we need them. Other people have turned to naturally occuring sleep aids, like melatonin. Melatonin is a hormone produced by the pineal gland in the brain. Its production responds to cycles of light and darkness. 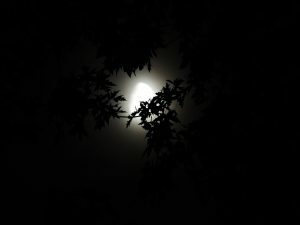 Darkness signals our pineal gland to produce more melatonin, hence the advice to keep a very dark sleeping area and turn off lights and screens as bedtime approaches. It’s also why some devices have bluescreen options that change the light tone to one that is more bedtime-friendly. For people who need a sleep habit reset, supplementing with melatonin can be helpful. A reset might be needed by people suddenly struggling with insomnia, but it’s also helpful for all of us when the bi-annual time change occurs, if we are travelling to a different time zone, or if life events have disrupted our sleeping schedule and we can’t seem to get it back. Help melatonin production and sleep quality by keeping your sleep environment dark. Melatonin can be helpful for shift workers whose sleep schedules don’t line up with natural cycles of light and dark. Some people work nights exclusively, others, like my husband, change from days to nights and back again, causing significant sleep disruption, sleep debt, and and depressed immunity. A melatonin supplement can help either of these categories. My husband takes Young Living’s ImmunePro supplement, which is intended to support the immune system and also contains melatonin. However, melatonin is best for helping people get to sleep. It doesn’t show much efficacy in helping people stay asleep–and for some of us, that’s the issue. Magnesium is a popular supplement for helping sleep. Magnesium seems to help melatonin levels and is an essential mineral. You absorb it through the skin more readily than through the digestive system, so a warm bath with epsom salts works as a relaxing magnesium supplement. Anecdotally, many pregnant women report less nausea and easing of restless leg symptoms when they increase their magnesium. Sleep is vital for students, parents, and teachers. No one has a great day if they’re short on sleep every night. This help ease everyone down and helps keep them settled through the night. Our society still tends to minimize the importance of sleep. We short ourselves on sleep in favor of entertainment, work, and non-sleep relaxation, but by doing so, we set ourselves up to be less functional, less effective, and sick. The connection between sleep and the immune system should be enough to drive us to our beds, minus a phone, Kindle, or other distraction. For those of use who don’t have a choice in our sleep hours or interruptions, we have to do what we can to increase the quality of sleep we do get. The alternative is both short and long-term illness risk. Previous Post Curly-Top’s Birth: Finally Going as Planned!